”Yo, I’ll tell you what I want, what I really really want !” (Excuse us.). 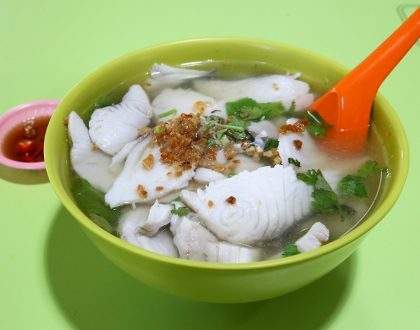 Foon’s Thai Recipe selling wanton noodles at Old Airport Road Food Centre seemed to be doing well enough, branching out with their latest venture Waan Waan, offering the current trendy coconut ice cream. 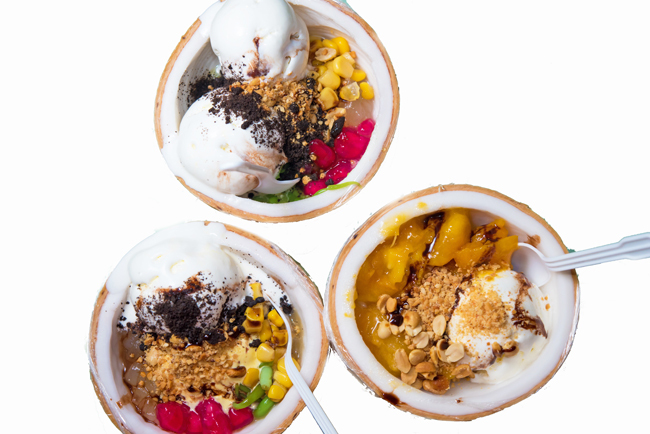 Mango sticky rice ($5.90), and ice creams ($3.90, $4.90 and $5.50) in three different portions are available. “Next time go for Jumbo size, 60 cents more for additional scoop of ice cream. Where to find such a deal?”, said an accounting friend of mine. The Jumbo ($5.50) aka coconut ice cream large came with 3 scoops of ice cream and 5 toppings. 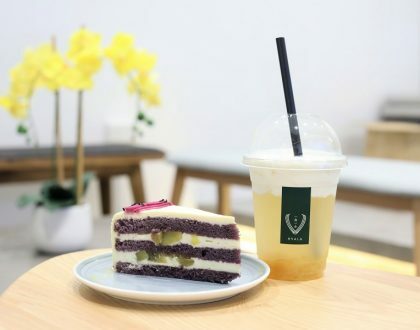 While the three flavours available are coconut, mango and Thai milk tea, the most popular Cha Yen flavour was sold out even before dinner time. The coconut ice cream was rich, creamy with distinct coconut taste. In contrast, the mango ice cream was too subdued, ‘weak’, not as pleasurable. 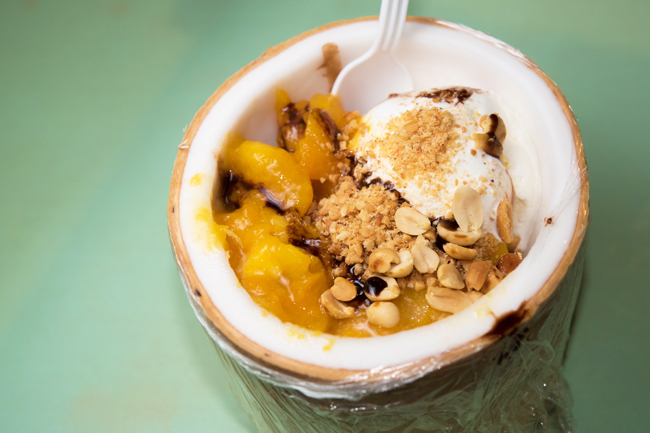 The Mango Stick Rice ($5.90) didn’t fare too well when we visited – one scoop of ice cream, mushy mangoes and less-than-generous portion of one tablespoon of sticky rice all in the husk. Minor feedback: Plastic spoons provided made scooping of the coconut flesh a tedious task without the risk of breaking some of them. 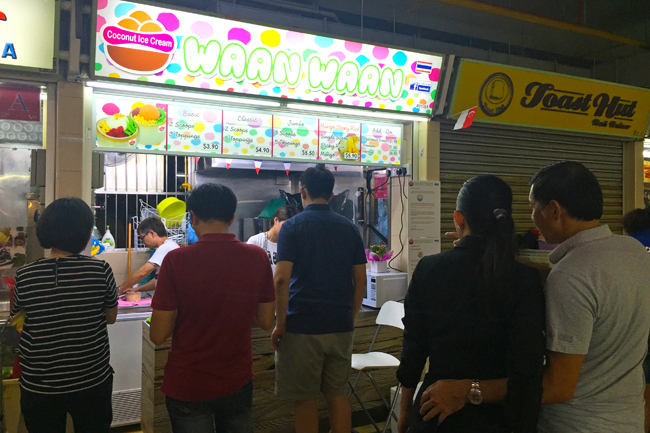 Waan Waan offers a selection of affordable and tasty coconut ice cream. 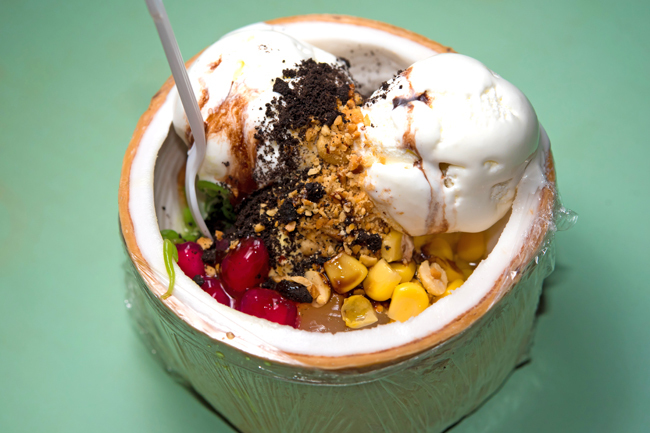 An alternative choice of dessert on top of the familiar ones we have within the popular Old Airport Road Food Centre. Do you want some Waan Waan? (Note: After this review went out, there was close to a thousand likes and shares, with more than 70k reach on Facebook. The stall has been experimenting a surge in customers. There has been feedback about slow service and items being sold out early – also refer to comments below. Here, i was wondering, why don’t you have a sign to stat or make a shout out that you guys ran out of toppings and help people to avoid queuing for something that is not available??? 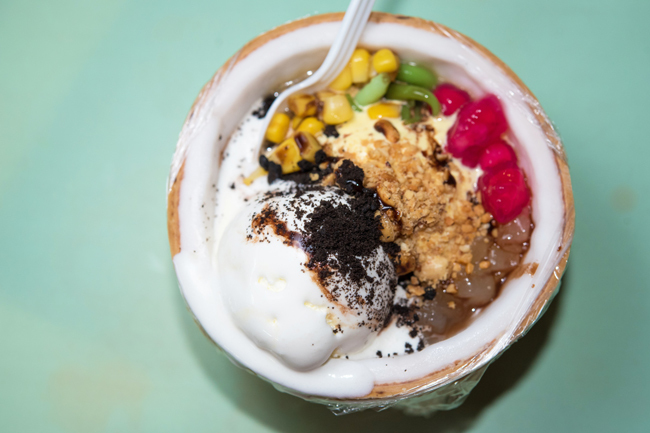 I was really disappointed with that, but due to the wait and i was really craving for coconut ice cream, i went ahead to order the ice cream without any toppings (I didn’t mind that i’ll lose out by not getting any toppings). I went ahead to pay, it costs $3.90, and went ahead to pay with my $10.00 note. I was given a change of $6.00 and told that they don’t have any more 10 cents change (without even asking if i have any small change to pay with). I wasn’t really pissed off with it because it was merely 10 cents, but this shows the second thing that pissed me off and adding on to the very unpleasing event of how unorganized Waan Waan is. Actually, unorganized is really an understatement, i can’t describe how annoying and unpleasant my really long wait of 15mins to get my topping-less ice cream at Waan Waan. There were a few orders ahead of me. Every single one of which are Mango sticky rice except for mine (as i watch the previous customers collect their purchase). They had only one fridge for the ice cream, and another fridge where they kept their empty coconuts. They had four staff standing around, only one man scooping the ice cream, one at the cashier, and 2 at the front counter to distribute the purchase. I was trying to be patient and just wait for my ice cream to be scooped. There were about 5-6 mango sticky rice combo they lonely man was scooping and half way through the process of preparing them, they ran out of mango…. You may think that this didn’t affected me much, but it certainly did. They man and staffs panicked and searched for the mango. Soon after the man pulls out a bag of FROZEN mango from the fridge and when to rinse/soak the bag of chopped frozen mangoes in the sink. Here i go, “really? this is the standard of a $5.90 mango sticky?”. But then again, my impression of this shop was already very bad. Now, never mind the food already, i just want my ice cream and leave here ASAP. The receipts had customer’s name on it and were “SUPPOSED” to be placed in order. After a long wait and watching 5-6 mango sticky rice went pass me. I supposed that it was the time for my ice cream to be scooped. BUT, the 2 customer behind me were served with Mango sticky rice first!!! What????? Really???? The long wait and now serving the customers we queued behind me, before i could receive my ice cream just because it was easier to serve the mango sticky rice first?! This really pissed me off so damn much, and half way through it, the 2 customers behind me who were supposedly to be served already found out that there are no more coconut bowls for them to use!!!!!!!!! The staff had the damn cheek to ask if they could serve it in a plastic bowl instead!!!!!! Everyone was so damn pissed. Why are you taking orders when you don’t even have the stocks or the ability to serve your products?! Then it was my turn and i took my ice cream and march off to eat it. Since I’ve waited so long for the ice cream, let me just finish it. The ice cream was P-A-T-H-E-T-I-C. I WAS UTTERLY DISGUSTED. The ice cream sucked and it literally tasted worst than a wall’s or marigold ice cream off the tub. I swear to myself I am never going to visit that stall ever again and please i beg everyone else to not waste your precious money on this rubbish dessert stall. I could easily used that money to buy any other cheaper and nicer dessert around. 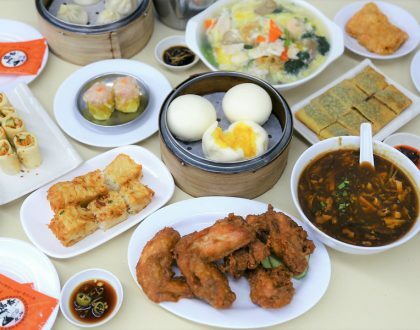 Danielfooddiary.com, please stop recommending this stall to the people around and damaging pockets with no yield returned.